In one week, my daughter will celebrate her last day of Kindergarten. Her last day as the “baby” of elementary school. Her last day of segregation. From now forward, she will eat with the other grades, play on a playground with other classes, and sit in a proper desk that is a regular size. She will be in school all day and have tons of homework and actual spelling tests. She will be in first grade. She will be, officially, a big kid. Excuse me while I go have a good cry. When Jordan started Kindergarten, she could write her name in capital letters. The J was always backwards. Always. On a good day, she could recognize numbers up to 20. Usually she’d skip a few when reciting them. She couldn’t read. She could not write very many numbers or lower case letters. Within a few weeks of starting school last August, she could write her name the “Kindergarten Way” (uppercase first letter, lowercase for the rest). Her J’s turned around and stayed that way. She started recognizing lowercase letters and writing her numbers. A couple of months into school she brought home her book bag for the first time. It was a ziploc bag with a reading book and log in it. Her first reading books were all picture-based. A page would say “I like trucks,” and the picture opposite it would have a truck. The picture guided her reading. I don’t know what level she was at, but it was low. Last week I checked her book. She’s at a 9. And she can read the words. She’s still sounding some of them out, but she can read it. A whole book. Those book bags also introduced us to word cards. Word cards are site words written on blue index cards and attached together on a ring. Every day we’d practice her words, painstakingly going through that ring of cards. Her first ring was small; it held less than 10 blue cards. Each week she’d take her book bag back to school and do a reading lesson and switch out her book. Once a week she’d have a word card test, administered by a mom volunteer. During these word card tests the kids went through the stack of cards and, if they said the word quickly (knew it without needing to guess or sound it out), they’d get the corner clipped. Over time, the stack of little blue corners became a challenge for them. How many could they get? Would they get them all? How many new words would they get to bring home? Jordan, who started out with less than 10 words last fall, now has 121 words clipped. It’s truly amazing. In January I took over one word card clipping day a week (out of two). When the other volunteer went on maternity leave in April, I took over both days. Last week I clipped the last of the cards. The year is wrapping up and the clipping has come to an end. I, being me, wanted to bring the class a special treat to let them know how proud I was of them. Immediately, I knew what I wanted to bring. 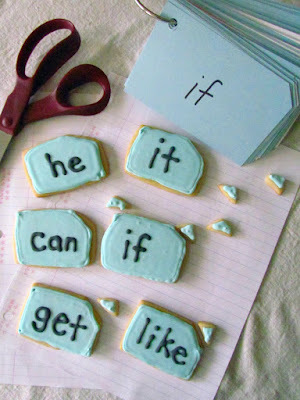 Word Card Cookies. I made them using my regular sugar cookie recipe. I tried a new Royal Icing recipe, from SweetSugarBelle and it was awesome. It worked great. The more I work with RI, the more patience I get. I had to wait a full 24 hours for the blue icing to dry before I could pipe the words. And I let it. I waited it out. My first few words were runny – the icing was too thin. I had to go back twice and add more powdered sugar to get the right consistency for piping words. But I had the patience to do it and the results were just what I’d wanted. I handed them out after school last week, and the teacher instructed the children that they had to read the word before they could eat it. And they did. Which brings me to the point of this post. I want to send a heartfelt thank you to my daughter’s teacher, Mrs. D, and her co-teacher, Mrs. O. Without them my daughter would not be reading. Or writing full sentences. Or adding and subtracting. You are amazing teachers who have an amount of patience that I can’t even imagine having. You deal with so much every day and you still manage to teach our children the basic skills they need to survive in this world. My daughter is more than ready for first grade, thanks to both of you. Thank you to all of the teachers out there. You all deserve a huge round of applause for all that you do. (You also deserve to make millions of dollars as a salary, but that’s a whole other post.) You work harder than any parent (who is not an educator or related to one) knows. I know, I used to teach high school math. I know how hard you work. What you do is amazing. I appreciate you. So does my daughter. I hope this summer offers you a relaxing retreat before you have to do it all over again. So thank you, from the bottom of my heart, for all that you’ve done and will do. You are the best. Beat all ingredients until icing forms peaks. This will take about 7-10 minutes on low speed with a stand mixer or 10-12 minutes on high speed with a hand mixer. *SweetSugarBelle gives a great tip for Royal Icing: Flavoring! Reduce the amount of water by 1 Tablespoon and add 1 Tablespoon of extract THAT IS OIL FREE. OIL and Royal Icing do not mix. Pure vanilla or almond extract are two good additions, but you can do any flavor you want. Just make sure to check the ingredients list first to see that there is NO OIL. After beating your icing until peaks form, transfer it to sealable containers (such as Tupperware), one for each color you are using. Add your coloring (if desired) and little bits of water until the consistency is thin enough to pipe but still thick enough not to run off the sides of the cookies. This will be your “edge” consistency. (Note: add a little to your pastry bag fitted with a #2 tip and test it. If it’s too hard to pipe, add more water. If it’s too thin, add some powdered sugar. If it doesn’t kill your hand and doesn’t run off the cookie, it’s good.) Edge your cookies and let them completely dry. To flood the cookies, add enough water that the icing disappears back into itself when it drips off the back of a spoon. Transfer to a squeeze bottle and flood the cookies. Use toothpicks or an offset spatula to help fill in the little holes. If you’re having to spread a lot, your icing is too thick. You can add more water to thin it. Let this dry completely. It might even take overnight. Be patient, let this step take the time it needs! You can store the royal icing overnight in the refrigerator, as long as it is sealed in a container. If you are doing detail on top of the flooded cookies, like writing, make sure the consistency is stiff enough not to run. This may need some trial and error, so be sure to have a few extra cookies until you get the consistency right. Add powdered sugar or water to thicken/loosen as needed. Let the decorations dry completely before covering. 1. These are adorable. I love that you also made the little clipped corner! 2. I also used to be a high school teacher. Oh, but not math. No way Jose. I still use my fingers to count and can’t multiple anything times 7 or 8. Those multiples are too difficult haha, Although my two closest friends from teaching are math teachers. Weird. These are so cute, what a great gift! BTW: Visiting from Something Swanky Linky Party. I love it! We’re still in sight words stage around here, too. Such a cute idea. Thanks for sharing at Sweet Indulgences Sunday on A Well-Seasoned Life. 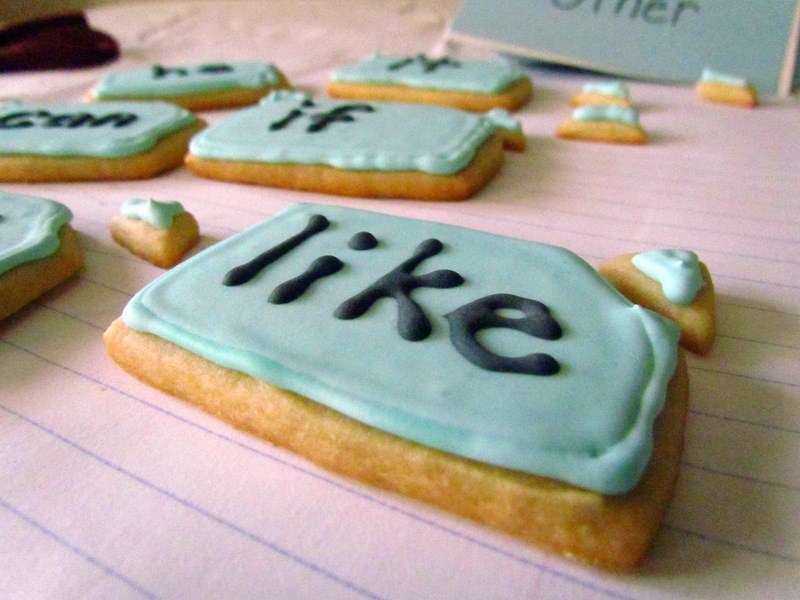 Ok, 2 things: #1, I LOVE your cookies, what a great idea! and #2, I appreciate your post for teachers, I am looking for my first teaching job and I have learned from the last year of working in a school just how dedicated teachers are! I can’t wait for it though. Have a great day! Teachers would go crazy for your cookies. So cute. Thanks for linking this up to Sweets for a Saturday.